Sky lanterns are basically a small hot air balloon made from non-flammable tissue paper, a bamboo rim and a thin wire supporting a wick made from wax coated cloth. They are sold flat packed and once they have been opened and the wick lit with a match or cigarette lighter, the heat generated from the flame fills the sky lantern with hot air. After approximately 30 seconds the sky lantern has enough hot air to rise into the sky. A sky lantern will rise to a height of approximately 1,000 feet (300 metres) and remain lit for over five minutes. During this time the sky lantern may travel up to two miles depending on the wind speed. 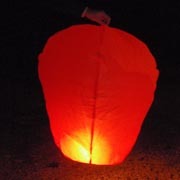 Once the wick has burnt out, the hot air inside the lantern gradually cools down and the unlit sky lantern falls gently and safely to the ground. As they are made from bio-degradable materials, the sky lanterns do not harm the environment.